Withania somnifera, known commonly as Ashwagandha, Indian ginseng is a plant in the Solanaceae or nightshade family. Ashwagandha is cultivated in many of the drier regions of India, such as Mandsaur District of Madhya Pradesh, Punjab, Sindh, Gujarat, and Rajasthan. The plant's long, brown, tuberous roots are used in traditional medicine in Ayurveda. The Sanskrit term Ashwagandha translates to "odor of a horse". Ashwagandha, also known as Indian Ginseng, Withania somnifera (scientific name). It is the magical herb, considered to be a nature's gift to mankind. Ashwagandha is cultivated in many of the drier regions of India, such as Mandsaur District of Madhya Pradesh, Punjab, Sindh, Gujarat, and Rajasthan. The Sanskrit term Ashwagandha, which means the odor of a horse. Its medicine properties are close to those of Ginseng. Traditionally, it is believed that a person who consumes this herb will gain horse-like strength and vitality. Ashwagandha contains minerals such as calcium, magnesium, copper, zinc, cobalt, iron, vanadium, flavonoids, alakloidi, vitamin-lactones and phenolic compounds and tannins, free amino acids, saponins, glycosides and proteins. 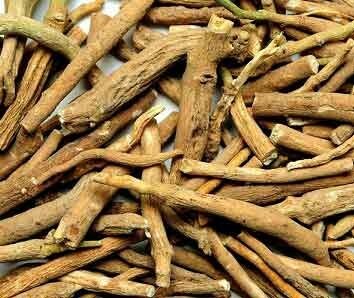 Buy ashwagandha online at best price from KiranaPlace, a online herb store in India. Ashwagandha helps combat the effects of stress. Ashwagandha helps to improves learning, memory, and reaction time. Ashwagandha reduces anxiety and depression without causing drowsiness. Ashwagandha helps to reduce brain-cell degeneration. Ashwagandha is a very good source of antioxidants. Ashwagandha helps to stabilizes blood sugar. Ashwagandha can be used to stimulate the thyroid gland. Ashwagandha possesses hemo-poetic properties, haematopoiesis is the process of producing new blood. Ashwagandha enhances sexual potency for both men and women.